Page of Wands says know yourself – master your internal blocks, obstacles and obstructions. Liberate your spirit – set it free to experience new adventures, renewal and new beginnings. Trust your instincts and enjoy yourself in a lighter more youthful way now. Allow yourself to experience life just for itself – free of external pressures. New beginnings, study and reflection – the qualities of a student who seeks new directions for self – growth and development. One who takes the tiger by the tail, is frank, uninhibited and forthright in speech. A message, happy news – a letter or telephone call that will please you and present the possibility of new developments in work or business. Good judgment is necessary now. Stressful situations and varied experiences have helped develop your self-confidence – allow yourself to express this sense of freedom and adventure by initiating something new. You will know enthusiasm, courage, power – there will be success with hard work and dedication to your goal. Highly intuitive, very sensitive, vibrant, fiery, humorous, sincere, attentive, uninhibited…a prodigy. Ruled by the drive for transformation. Super consciousness, spiritually playful, spiritual innocence – purity. The transformation side of things intuitive/spiritual and represents new opportunities, situations, events and guides which bring messages of exceptional insight and inspiration. Spiritual renewal – spiritual news through insight, inspiration, guide’s messages, serendipity (finding value in things not sought for), synchronicity (coexistence, coincidence – a series of events happening at the same time – spontaneity). The fountain of spiritual youth which keeps your souls vigorous (full of physical strength and energy) in the Earth Plane. What new territories or ideas are you checking out? In the first position: Like the other Pages, yours is a world of constant discovery. But your wonder embraces the fascinations of all three of their worlds, the material, emotional and mental and to that is added the wonder of continual spiritual revelation. In the second position: This is the advantage of insightful meditation, good prayer, spiritual divination, to bring us information that will help us in our physical lives. Your best resource is your access to the information you need for your health and business. In the third position: This child is coming to you in person or sending its lessons through other signs in the Spiritual Plane. Accept with open arms the changes that have come to your spiritual house. In the fourth position: Here can be seen a love of the spirits that enliven spirit itself, that give it its name and identity. These are the energies, the guides from above which illuminate the pages of our Karmic Contract to remind us of our timely lessons. This passion is a love of God through his messengers, the archangels and the guides from our karmic lineage. In the fifth position: This Page has your attention, either in person or influence. It has brought renewal and the potential for a whole renaissance of activity, a different phase to your spiritual house. In the sixth position: The Page of Wands may be arriving in person in the near future. Person or not, the influence here is to reinvigorate the heart with the innocence of spirit and draw support for spiritual change. This generates new possibilities in existing relationships and/or new relationships/creativity. In the seventh position: Your mind will be on this Page in the near future. You are pulled more and more into the element fire and her ways as you listen to her spirits – the salamanders – your guides. The mind is called on to invest in the future by embracing youth principles in the Spiritual Plane. In the eighth position: This youth is in your physical house. You are learning directly from spiritual interaction what will change your material affairs, even your attitude and approach to your health and appearance. In the ninth position: Your heart is on this youth. He/she may be the object of your love or the centerpiece of a creative project underway. In the tenth position: Here is youth, the freshness and purity, the new resources you need for your program in the Mental Plane. 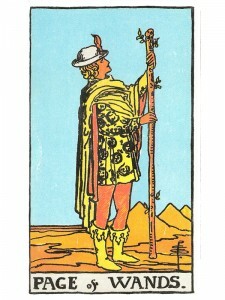 It may well come to you in the personage of the Page of Wands or it may be the access to what he/she represents.